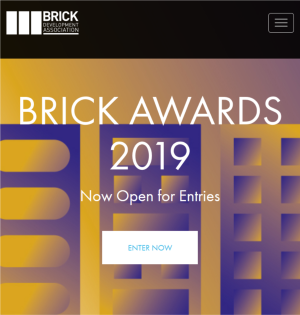 Brick Development Association has announced that entries are now open for the Brick Awards 2019, which closes 31 May. We are delighted to call for entries into the Brick Awards 2019. The annual Brick Awards celebrate the best examples of clay brick in our built environment. Each year the awards attract over 300 entries from leading architects, housebuilders, developers and contractors, across 15 hotly-contested categories. It’s FREE. It’s simple. It’s easy to begin. Entries will close on 31st May 2019. To find out more about the Brick Awards click here to email us or ring 0207 323 7033.